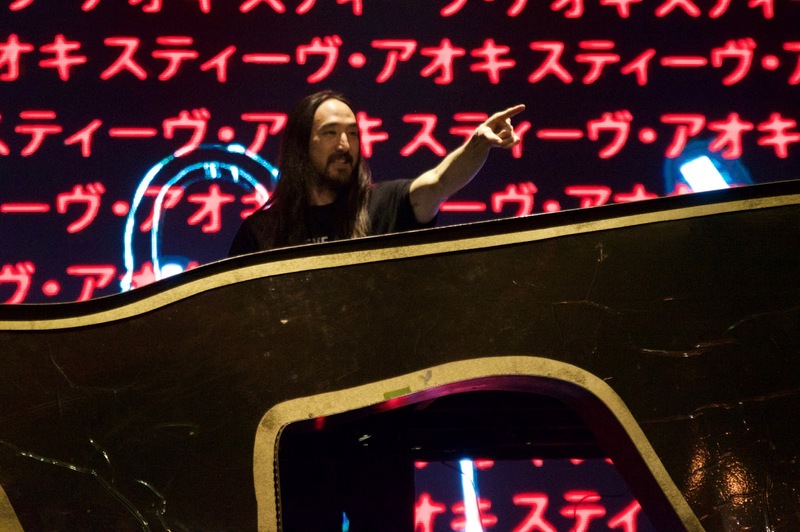 Steve Aoki didn't sell out the Uptown Theater on Sunday night and his set wasn't perfect, but there was certainly no shortage of happy fans waiting to see him. The Miami-born producer, known for his colorful approach to dubstep and electro-house, did everything in his power to brighten up the evening of his followers. Aoki's tour came with a video board, loads of confetti, smoke cannons, and six towering columns of lights in tow. His stage production matched the bountiful energy he displayed while hopping up and down to almost two hours of his music, but that music, however, wasn't always what it could've been. 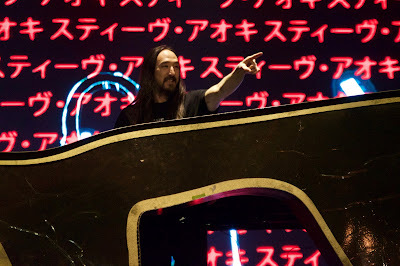 Aoki dropped cringe-worthy remixes of several songs including Macklemore's "Can't Hold Us," Nirvana's "Smells Like Teen Spirit," and Owl City's "Firefly." And even if fans enjoyed these songs originally, the remixes often didn't incorporate the songs' melodies (or any other elements really) after their proverbial "drop." Despite possessing an impressive aim as he nailed 10 smiling fans with cakes near the night's end, the Dave Grohl of EDM failed to convert any non-fans -- as few as there were. Brooklyn rapper Desiigner took the stage before Aoki for a 30 minute set that incorporated all of his biggest tracks and an immeasurable amount of energy. Desiigner couldn't sit still for more than a few seconds before deciding to jog across the stage, spray fans with a water bottle, or toss his wireless mic through his legs, into the air, and back into his hands. He had one on stage with him, but Desiigner hardly needed a hypeman. His intense stamina couldn't have been a better fit for a tour of this nature, despite how strange it would be for any other artist on GOOD Music. The show was opened by two other EDM acts, Grandtheft and Bad Royale. The former dropped a series of pop songs into their mix that would've been ironic in any other setting, along with Tech N9ne's "Caribou Lou." The latter played a similar set, but allowed their affinity for classic reggae music to be a bit more pronounced.